“Please. I can’t sleep. I had a bad dream.” (Interesting because, again, he wasn’t asleep to even dream at all!). I looked over at my husband with the remote in his hand already hitting the pause button with a sigh. Up the steps I went. We got to the bedroom and I was getting Henry settled in. Again. I asked him what was bothering him. I’m downstairs at my computer trying to work. The little ones are upstairs in my bedroom watching something on TV. Big Sis, Molly, and her friend L came running into the house all giggly and silly (you know, typical 14-year old girl stuff…well, typical for these two anyway). I hear Henry and Lucy shrieks and then some chaos ensued and all 4 kids came running down the stairs shouting and laughing. 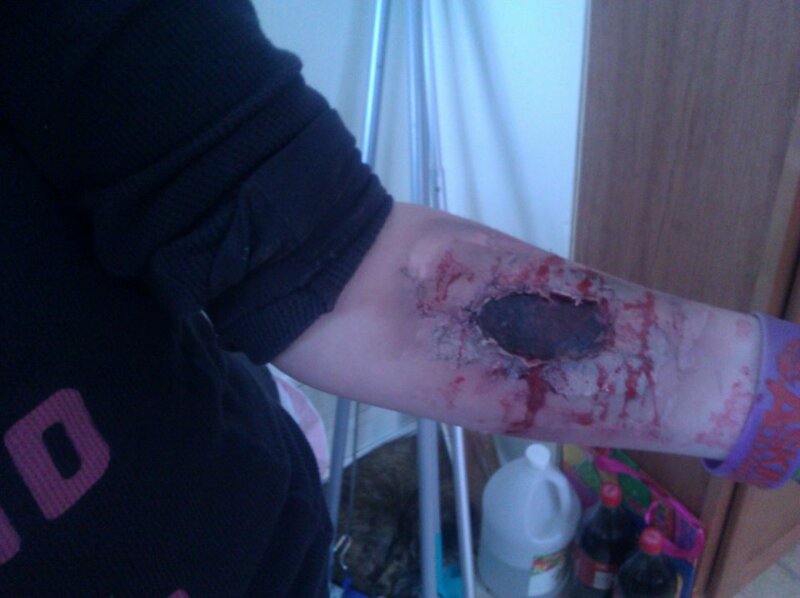 Apparently L was practicing special effects make-up on both her own arm and Molly’s. That girl has SKILLS! Even up-close and personal it was pretty realistic! Well, as realistic as some kind of Zombie-type flesh wound can be. The two little ones had been repeatedly reassured that it was not real and they were laughing, although Henry wouldn’t touch it. I admit, I was hesitant myself! So, back to later that evening and getting Henry back into bed. Still talking about the girls’ arms. “Yeah, ALL of the time!” he says with an exasperated eye-roll. He’s ticking these facts off with his fingers to really make his point. “Even though you know it wasn’t real?” I ask. “Yes, Mom. Even though I know it wasn’t real.” he says matter-of-factly. Okay, changing tack here. It’s getting late, I really want to be finished watching the dog show before 11pm, and I’m tired. He went to sleep, I got to watch the dog show. No moulage nightmares. Yesterday, Valentine’s Day, the kids were still talking about it and how cool and real it looked! When Molly got home from school they were asking to see it again! Molly had to show them that it had all been washed off. Oy! It was really cool. Next time I just ask that the girls give me a heads-up what their coming in looking like! And I’m thinking I want to hire L to do some cool make-up for me next Halloween…or Valentine’s Day.